It's getting a bit whiffy, but Eddie Dawkins' world championship jersey hasn't lost any of its lustres. 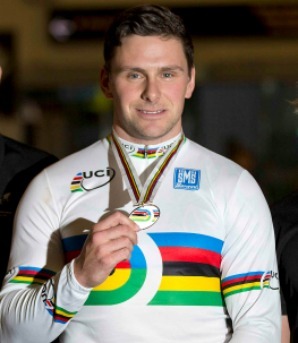 The New Zealand track cycling star, who claimed a world title along with Ethan Mitchell and Sam Webster in the team sprint at Cali, Colombia, last week, is looking forward to presenting the rainbow jersey - cycling's ultimate status symbol - to his parents when he finally gets back to Invercargill after next week's elite national championships in Cambridge. "I better bloody wash it," he joked yesterday. "I'll probably give it to Mum and Dad, get it framed or something. It's huge, the buzz hasn't gone away, it will be around for some time." Dawkins is still coming to terms with being a world champion. He rode a furious last lap in the gold medal final to edge ahead of the Germans on the finishing line. After finishing second to them in Belarus 12 months before, it was the ultimate result, Dawkins said. "It was pretty surreal. I got back to the hotel quite late and had a beer with the whole team and had some dinner. I went to bed, but couldn't really sleep," he said. "It's been a long road to that day. A couple of close calls with races we should have won, but for it all to come together on the day was quite spectacular." Dawkins said the arrival of Anthony Peden as New Zealand sprint coach had helped take the programme to another level after they had previously won bronze and silver at world championships. "He's really good, really level-headed. He hasn't tried to change too much, just seen how things go and added some input. We've come along in leaps and bounds really. We are all fairly young and hopefully we can all grow as bike riders together and have very long careers." Dawkins said with the Rio Olympics now just three years away, the Cali result had painted a target on the New Zealand team. "It's pretty good to see some of the reactions from coaches from other teams. They are all very gracious, they come up and shake your hand but they have their eyes wide open now." Nearly every day Dawkins has watched the video of the gold medal final. "It's all a blur; I'm just trying to keep up with the other guys. They are going so quick that I'm just hanging on for dear life and then I do my lap at the end, keep the bike as low as I can on the track and then do a big lunge for the line. I knew [we'd won] almost instantly, but I had no idea it was so close until I looked at the times and the video - it's ridiculous how close it was." A groin injury meant Dawkins was unable to race the keirin or sprints in Cali, but he's confident he'll be able to back up at the national championships in the new Cambridge velodrome. "It's fine now. I'm having an MRI scan to give myself the all-go to race nationals. It was really sore the day of the keirin, but it's mellowed out over the last week and it's almost pain-free now."